Keep in mind that bitmap manipulation involves memory structures not even related to displaying the bitmap. And windows does have internal buffers involved with any window that has a graphics client area, which is regardless of a screen. It's part of how windowed GUIs are managed. These buffers aren't actually on a virtual in-memory "screen", they are all separate chunks of memory associated with any window that has a graphics client area. Fortunately, since these buffers are changed using Windows API calls, RDP has the information available to know whether just a portion of that window's client area needs to be refreshed, or the whole client area needs to be refreshed, without having to compare a copy of the entire screen to the current screen, like VNC would do. In any event, bitmap data will use more resources, but I don't think more than having a local screen. I think the CPU utilization is due to the amount of data and communications involved with getting all of the bitmap changes from the remote computer to the client computer. Also, there are options to turn off any animation, such as when you drag a window, to only show the window's border, not its content, while dragging. Dragging is then very fast if that option is used. However, since we're talking about a usage of RDP involving astrophotography and image display the entire process can be pretty resource intensive for the host. After all, we're not talking about updating the display of a few lines in an Excel spreadsheet. Thus, it depends upon the application and for the use we're discussing I'd suggest that it can require quite a bit of overhead on the host. Also, I'm not certain that the internals of a remote host implementation would be the same given a target OS. Thus, how the host and client work under Windows may not be the same as when the client is running on Mac OS or iOS. What I mean is that a client running on Windows may require less work from the host than a client running on a different OS. I'd think that the best practice would be to disconnect from RDP unless you need to change configurations or view something that requires live updating (like focusing or checking the quality of an image -- all of which are probably bitmap transfers and thus resource intensive on the host). "However, since we're talking about a usage of RDP involving astrophotography and image display the entire process can be pretty resource intensive for the host." We need to be a little more specific. Are we talking firecap or everything else (non-video), because I haven't had even close to an issue with everything else, and that is on a Mac. With regards to firecap, for an ROI of 300 x 300 I get over 100 fps, but after that things do slow down. Of course, I am on USB 2 because USB 3 disrupts my WiFi. And except for large moon images, that is all I need, 300 x 300. However, if you minimize the firecap window, that should be sufficient. I haven't tested that yet. But yes, video is really intensive. "I'd think that the best practice would be to disconnect from RDP unless you need to change configurations or view something that requires live updating (like focusing or checking the quality of an image -- all of which are probably bitmap transfers and thus resource intensive on the host)." If I wanted to do very fast full frame stuff, I would probably do it at the remote machine. But that is like 1% of what I do. Is another factor here the weakness of that stick? Or, are we just talking large frame video applications in something like firecap? I just received my 802.11AC range extender from Amazon and also a new USB3 hub by Anker. The Anker hub is interesting because it uses the same micro USB connector for power as does the Compute Stick. Furthermore, the power adapter for the hub is rated at 2.4A, 5V and it seems to power/boot the Compute Stick without problems. The power cord for the hub is just a short USB to micro USB cable and it disconnects from the actual power supply so you can use longer cords if necessary. It's going to be interesting to see if the hub power supply works with the Compute Stick when everything is fully attached and running under load. If it does then the Anker power supply might be a good backup (or replacement) for the captive power cable that came with the Compute Stick ("captive" in the sense that on the Intel power supply the cable is permanently attached to the power supply -- it's a standard wall-wart type power supply). At only $20 if the hub works well I may buy a second one as a backup for both the USB and power. Below are some pictures of the Compute Stick and hub combination. It's very small as the hub is actually almost the same size as the Compute Stick. I'm going to make a small spacer to fit between the two units so that when they are stacked they aren't in direct contact, that should allow better cooling. In the picture, the black cube nearest to my wrist is the hub's power supply, it's very similar in size and shape to what Apple supplies with their iPhones and iPads (in fact, Anker says that it can be used as a generic recharger for phones and other mobile devices). Now if the range extender solves the 5GHz WiFi problems I should have a configuration that is ready for some serious outdoor testing. That's a perfect hub for a stick pc. Okay, the 802.11AC WiFi range extender seems to have fixed the problem I was having when the Compute Stick was outside with a single wall between it and the WiFi router that I use in my home. So, I now have plenty of bandwidth in the 5GHz WiFi band even when the Compute Stick is outside at the normal setup location of my scope. However, while testing the connection I discovered that there is still an intermittent problem with the WiFi when a USB3 device is connected to the Compute Stick. I've tried about everything that I can and it seems that if you connect a USB3 device to the Compute Stick the WiFi connection will very often immediately quit. I've looked high and low for any explanation and then I went to the Intel forums on the Compute Stick and there I found several threads where people are having the same issues, WiFi drops as soon as you connect a USB3 device. In fact, it looks like this is a known problem and Intel doesn't as yet offer any solution other than to tell you to reinstall software (which from the user feedback on the threads doesn't seem to help). Also, there are a few users who have gotten replacement Compute Sticks for this problem and they report that the new unit did NOT fix the problem. Thus, I've kind of concluded that you can't reliably use USB3 devices on the Compute Stick if you also plan to use WiFi. I suppose it could be a hardware design fault that is just coming to notice. Perhaps this is why they moved some of the USB3 ports to the power adapter on the new M3/M5 version of the Compute Stick. Interestingly, when operating in the 5GHz band I've seen some evidence that you can occasionally get a stable connection even when using a USB3 device, but on other occasions it is instant death to the WiFi. There is no solution given on Intel's Compute Stick forums, but I think it may be a simple case of interference between the USB3 and WiFi in the Compute Stick. So it drops the connection then I am assuming you can't reconnect or can't keep connected with some stability with the USB 3.0 active. I have only been using USB 2.0 and don't have any USB 3.0 devices.. Maybe a USB stick which I can try to see what happens with mine. Not many more options.. would an external usb wifi adapter have any more luck? It could be put on a small extender and keep it further away. No you can't reconnect, the WiFi is completely dead. Since I've seen it work with USB3 quite well on SOME occasions I'm hoping that it may have something to do with the auto band selection that is negotiated between the my router and the range extender and Compute Stick. I've already learned that my Apple router is DFS certified which means that if it is set to auto band selection it may select a band that is not supported by the NetGear WiFi extender that I bought. So, I have to set the 5GHz band manually on the router so that it can connect to the NetGear extender. What may have happened in the past is that the auto band selection just happened to settle on a 5GHz band that works when USB3 devices are connected (or more specifically, worked when connected to my ASI178MM camera). What I fear, however, is that different USB3 devices may require the use of different bands to avoid device specific interference, which means that I may not be able to find a single band that will work with every USB3 device that I want to use. Of course, this assumes that the band selection really has something to do with the intermittent nature that I've seen with USB3 devices on the Compute Stick. It may be something that is completely out of my control, like a driver or hardware bug on the Compute Stick. One good thing I did discover today, the power supply that came with the Anker USB3 hub works to power the Compute Stick. 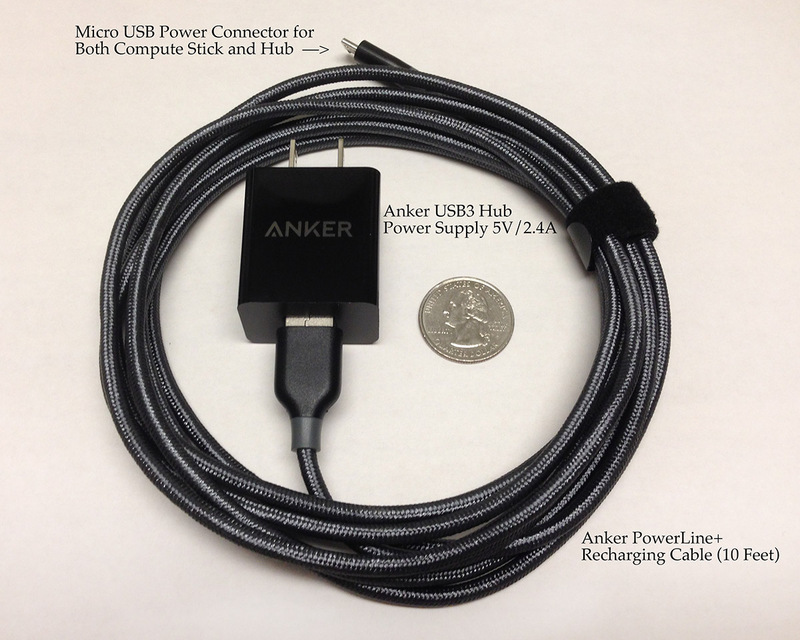 In fact, I even used a 10 foot long micro-USB recharging cable that I also got from Anker and that seems to work fine to power the Compute Stick. So, if this proves to be a robust solution to power the Compute Stick it will give me some other options for power. The same thing happens with my Netbook. The WiFi degrades and crashes when I connect USB3. And that is with ASI's cable, which I thought was an ok cable. A very tentative report on the USB3 issues (more testing could reveal that I'm just seeing a lucky "fluke"). I tried a different 5GHz WiFi band and my USB3 and WiFi seem to be both working very well. I've had a Sequence Generator Pro session running for over 6 hours with my ASI178 camera and a USB3 thumb drive both connected to the Anker USB3 hub and the connections and performance of the WiFi looks quite good. In addition to using the USB3 connection to the camera I am actually saving the captured files to the USB3 thumb drive and I have two more USB2 devices connect to the Anker hub while all of the above is happening (a filter wheel that is being used by the SGP session and a digital focus indicator connected to an RS232 adapter). By the way, the USB3 hub is running on its own power supply. The channel that seems to work is 36, and I know from previous testing that channel 161 does NOT work. When the WiFi does fail (like on channel 161) it's almost like someone has thrown a switch, it happens essentially instantly and it doesn't just degrade it drops completely. The wireless connection is lost and you can't reconnect until you unplug the USB3 device and then you can reconnect and everything is fine again. However, on channel 36 there seems to be no affect on the WiFi even if you plug and unplug the devices repeatedly and (more importantly) the WiFi performance remains as good with the USB3 device as it is without USB attached to the Compute Stick. I'll need to do more testing on the other channels to see if a pattern is present, but right now I'm hopeful that I've found a solution. The first thing to check is to see if channel 161 is still experiencing the disconnect problem. Interesting paper on the intel website about wifi and USB3.0 interfering with one another. After reading it, I think that I will probably just try to connect my ZWO camera when it arrives using a USB 2.0 cable. I don't know what I would do with the camera that would require such a high bandwidth connection. I can see that others may have special needs - planetary imaging for example - that need USB 2.0. Is the interference coming from the stick itself or from your USB camera? I assume that it's the camera. Usb3 and 2.4ghz wifi has known interference regardless of manufacturers. Yes, but I'm talking about the 5GHz band, not 2.4GHz. If you do a search you'll generally find NO one talks about interference between USB3 and 5GHz WiFi (most sources say it does not exist, that's actually the common solution for using USB3 devices with WiFi). However, it does appear to be a problem with the Compute Stick, either because of problems with the design (poor USB shielding?) or because of a hardware or driver issue in either the WiFi or USB3. In any case, having a USB3 camera can make a big difference for lucky imaging with DSOs. In fact, speed is one of the current problems with Sequence Generator Pro (SGP) because that app is very slow to download and save subs. Just the download time for each sub can take longer that a short one or two second long exposure. Then, SGP is also very slow to save the file. Thus, for short subs the overhead per image becomes huge and you can waste 70% to 80% of your image time just in the downloads from the camera and then saving the files to disk. However, with Firecapture and my ASI178MM I can capture 5fps at full frame (6M pixels, 16 bits) which includes the download over USB3 and the writing of the data to the Compute Stick's micro SD card. Thus, even a one second sub has only about 200ms of overhead and I can capture about 50 subs per minute with a 1 second exposure time using the USB3-based ASI178MM and Firecapture. With USB2 you'd probably cut the throughput with a 1 second sub to something like 30 to 40 subs per minute (best case, with Firecapture and you could probably forget about trying to use SGP). In any case, I'd prefer not to have different setups for the computer, WiFi, and cabling when I'm doing lunar and planetary work versus DSOs. What I'd like is one small package than can operate over WiFi that gets the job done as quickly as possible whether I'm doing planetary or DSO imaging. Edited by james7ca, 29 May 2016 - 06:49 AM. I have not seen any slower performance with downloads and saving files with SGP verses MaxIM DL ( or others) on a standard PC. I've also noticed download speed is worse with the stick vs a laptop with SGP. Something I've just dealt with. I actually recently experimented with SGP and a combo of Backyard Nikon. SGP to frame and BYN to capture. This is for the DSLR. "I have not seen any slower performance with downloads and saving files with SGP verses MaxIM DL ( or others) on a standard PC." I think he is comparing to FireCapture, which is a whole different animal. I am doing lucky imaging with DSOs (using FireCapture) but not full frame, and mostly stellar, not nebulous. I was forced to stick with USB2 because of the WIFI issues, which gives me over 100 FPS up to an ROI of 300 x 300. If I wanted to do full frame, I would have to do that at the remote PC itself, which would be difficult with a stick pc because there probably isn't a monitor attached. I tested the intel compustick to run my system. Currently I use one of these. I found the processing power and available memory caused random errors, plus the 5V power requirement (which I resolved using car USB phone charger). I decided to give up on the idea. The built in serial port of the Qotom computer, not needing a USB hub, plugging the camera direct to computer out weighted extra 1 lb weight. Yes, in comparison to Firecapture. However, in my hands when running on the Compute Stick SGP takes about 5 seconds to download and save a single 12MB sub (6M pixels x 16 bits). However, Firecapture can do the same in about 200ms which is 25 times faster (as I mentioned earlier, with Firecapture I can run at about 5fps at full resolution on the ASI178MM camera). I've done some more testing on channel selection with 5GHz WiFi and I can now say with certainty that channel selection makes a huge difference when I have a USB3 device connected to the Compute Stick. Basically, some 5GHz channels will not work when you have USB3 devices connected to the Compute Stick. I think it is either a bug in the driver or the hardware itself. In any case, when I manually set the 5GHz WiFi to channel 36 on my basestation then the Compute Stick has NO issues when using USB3 devices. It seems to be rock solid on that channel (and probably others, although I've only checked channel 36 and I know for certain that channel 161 won't work at all when you connect a USB3 device). Then, I also have a QHY 5L-II guide camera connected to the USB2 port on the Compute Stick. The ASI178MM and filter wheel are being controlled by SGP and the guide camera is being run with PhD (all active and capturing data). I also tried some file transfers from the Compute Stick to my Mac running RDP and I was getting about 4MB per second over the WiFi network even while the Compute Stick was actively capturing 1 second subs with SGP. During the file transfers I was seeing peaks on the WiFi between 30Mbps and 40Mbps. Overall it seems to be working pretty well and I've done an additional 10 hours of continuous active testing indoors over the last two days. The only problem I had then was with the QHY 5L-II guide camera because after about 10 hours of continuous operation and a few exposure and gain changes the camera seemed to be outputting some odd frames every few seconds. However, a power cycle on the camera (quit PhD, unplug/replug the camera) seemed to fix that without any other changes to the Compute Stick or the RPD session. Edited by james7ca, 30 May 2016 - 02:45 AM. Thanks for all of your testing. I just finished another day of testing and this time I used the Anker USB hub power supply with a 10 foot Anker PowerLine+ Micro USB to USB cable to power the Intel Compute Stick. It seemed to work without problems and I put a lot of stress on the Compute Stick trying to keep the CPU usage at 100% while also transferring images from the Compute Stick's micro SD card slot to the host RDP computer (a Mac mini) over the 5GHz WiFi. 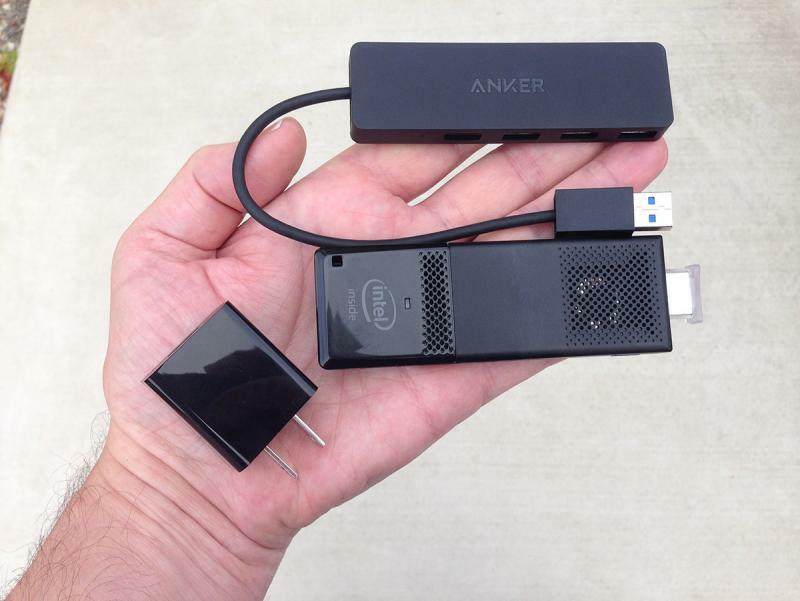 Even though the Anker power supply is rated at only 2.4A it seemed to work without a single hiccup (the power supply that comes with the Compute Stick is rated at 3A). Given the rather hopeful results I've had over the last few days I've decided to configure a mobile setup for the Compute Stick. To do that I just ordered two DROK 5V 5A/25W step-down voltage transformers with associated connectors (USB and 12V battery) that will allow me to power both the Compute Stick and the Anker USB3 hub with a 12V deep cycle marine battery. For the mobile application I also have an Asus 802.11AC router that can run on 12V/1A so this means I'll be able to run everything with a couple of 12V batteries (mount, WiFi router, Compute Stick, USB3 hub, camera cooling, dew heaters, and the associated USB devices connected to the Compute Stick and USB hub). Then, when I'm at home with A/C power I can just run the Compute Stick and USB3 hub using the Anker 5V power supplies over the same 10 foot Anker PowerLine+ cables that I will use in the field (I purchased a second Anker USB3 hub for backup and also to get a second Anker 5V/2.4A power supply). That will leave only the mount, camera cooling, and dew heaters to be powered by 12V which I can do with my existing 12V power supplies. The last component (while at home) will be the 802.11AC WiFi range extender which is powered by A/C but that won't be a problem since I'll be using A/C to power all of the other 12 and 5 volt adapters. Thus, when home I'll be able to power everything from the 120VAC mains and while mobile I just need some 12V batteries (and in both locations the cables and connections from the ground upward will all be the same -- 5V or 12V -- except for the WiFi range extender which I will only need at home). I'm still considering whether I should also take 120VAC when I'm mobile. I already have an inverter that could attach to one of the batteries and I guess I could use that as a form of backup for the 12V-to-5V step-down transformers. My goal is to have a relatively compact system that will operate about the same whether at home or in the field. So, same signal (devices) and power cabling on the scope in both locations and no need for a notebook computer and everything (or nearly so) controlled over WiFi. Below is a picture of part of the "solution," the Anker power adapter that works for both the Compute Stick and the USB3 hub and also the 10 foot-long Anker PowerLine+ cable (rated, I believe, at 3A). Edited by james7ca, 31 May 2016 - 05:25 AM. I run everything from battery whether I'm home or remote. There are enough variables already when going remote, it's good to use the same electrical system all the time. The Drok converters have been very reliable for me, inverters have their own sets of problems (efficiency, dirty sine waves, noise) that I prefer to avoid. Yes, I'd like to avoid an inverter if possible. What I'd really like to find is a very small, fanless, 12V-powered, computer that had at least six USB ports, a micro or full-sized SDXC card slot (preferably UHS-II), and 802.11AC wireless. 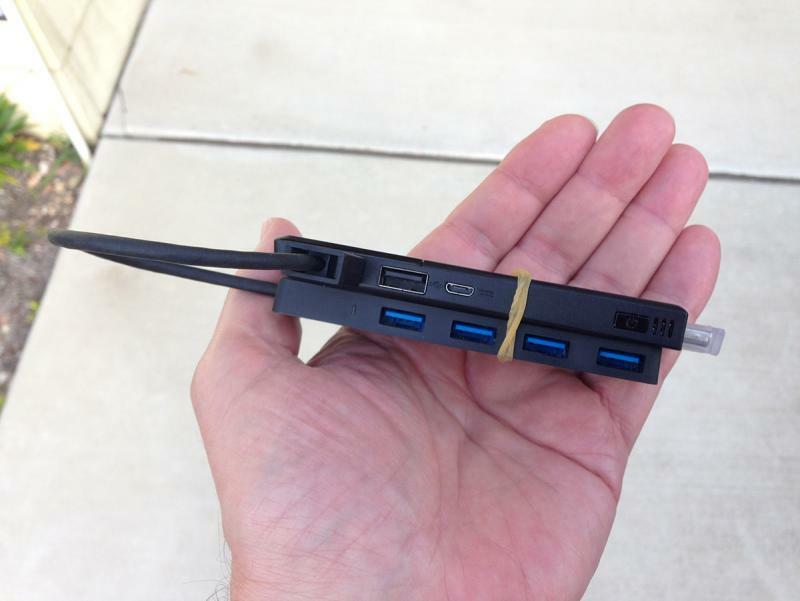 I've found a few systems that are close to that, but nothing either as cheap or as small as the Intel Compute Stick (with the addition of a USB hub). The small fan in the Compute Stick doesn't bother me much, other than it might not have a very long service life. However, at only $140 it probably isn't that crazy to consider having a second Compute Stick for backup. The systems that I've found that come closest to the above requirements seem to be the ZOTAC ZBOX C-Series or one of the industrial units from QOTOM. However, the ZBOX runs on 19V and the QOTOM units seem to have a range of ports more suited for industrial applications (and apparently no standard WiFi -- it's some kind of option). The QOTOM units run on 12V and they seem to ofter an almost endless range of options for the ports (dual ethernet, up to four RS232, etc.) but after looking through their offerings I didn't see anything that had enough USB ports, with standard WiFi and a SDXC slot (although I guess you could add the latter two over USB). I also don't like the fact that QOTOM apparently ships WITHOUT identifying the HDMI port so that they can avoid import tariffs/regulations (I'd be concerned mainly about compatibility, not legality). ZOTAC just announced a new set of models in the C-Series. They apparently have improved (greatly?) the passive/fanless cooling and now offer newer chip sets including the 6th Generation Skylake Core i3 and i5 CPUs. Unfortunately, they also updated the USB ports so that they no longer have a 2+4 set of USB2/USB3 but rather a 2+2+2 set of USB2/USB3/USB-C. In the latter case I guess you could just use a USB-C to USB3 cable, but they also changed the port placements to something that I don't like as well as the older models. I guess you can't have everything. Furthermore, since no one is currently carrying these new models I have yet to find any information on their cost or even when they will actually ship. Besides that, the Skylake CPUs are probably overkill and require a lot more power than the Atom-based units. Edited by james7ca, 31 May 2016 - 02:45 PM. Yet another great thread to follow. As I work towards adding guiding to my setup, I've been a little apprehensive about leaving a laptop out in the elements. As long as I can get this to connect to my wifi, it looks like a great headless controller for PHD and BYEOS. Thanks for all the info! As for mount control, one of the USB ports on my Anker hub goes to a USB-to-twin-serial port adapter where one of those two serial ports is connected to the input on my mount's controller. Thus, I have the full ASCOM interface to the mount which can be used either for guiding or mount control. The ASCOM driver supports configuration of the mount, slewing, and gotos but I've never used anything that elaborate over the serial port since for most of the mount operations I just use the mount's hand controller (which has a pretty complete set of DSOs and, of course, planetary locations). However, I can also use SkySafari over WiFi but I think that would require me to switch between the 5GHz WiFi network I use to control the Compute Stick and the ad hock, 2.4Ghz setup that works with SkySafari, so that wouldn't be very convenient. About the only thing that I'm missing is auto focus control but I still have one open USB port on the hub so I may eventually look into doing that. Edited by james7ca, 31 May 2016 - 03:18 PM.